We have many years' experience in collaborating with clinical depatments and research laboratories, national as well as international. Our research group is idea generator, promoter and central organizer of these collaborations. 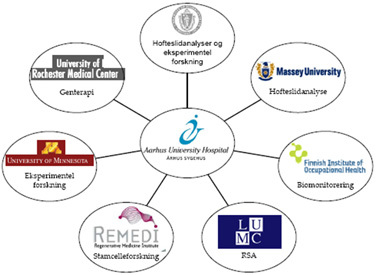 The group priotizes a broad collaboration across specialites and disciplinary groups in order to ensure expertise and numerous patient data in the clinical research. The present network is built up through a long research tradition. The existence of a solid network is crucial when implementing new project ideas and maintaining visions of a broad collaboration across centres and disciplinary groups. To read more about our collaborators, click here.